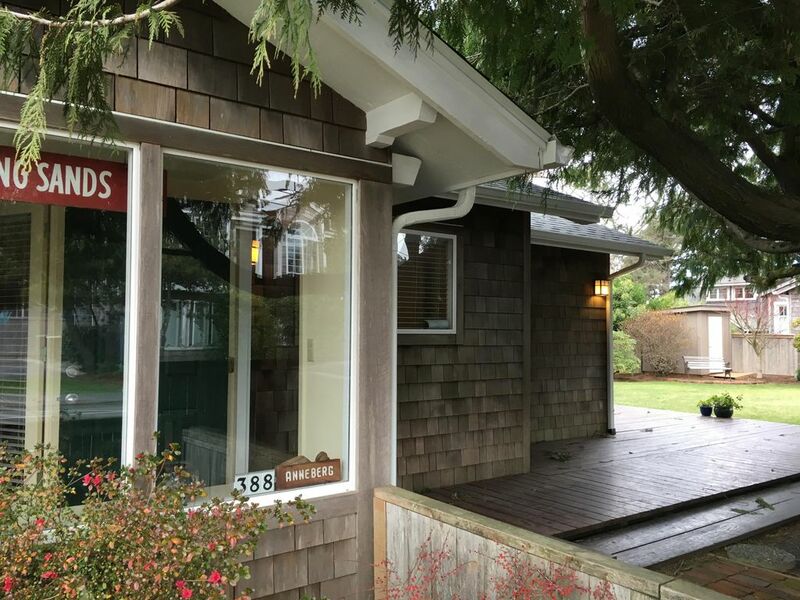 Lieu: 388 S Hemlock (coin de St Hemlock et Adams St) Cannon Beach, sur la côte Nord-Ouest, Oregon, USA. Vraiment un endroit idéal (regardez une vidéo sur youtube intitulée Singing Sands Beach House ou copiez-collez https: // youtu. Be / GCViheH0aqk dans votre navigateur pour voir la vidéo de la cour à la plage ... vous pouvez voir la proximité de Haystack Rock et de la plage) à seulement 1 pâté de maisons de la plage de sable blanc et à 2 pâtés de maisons du centre-ville. La maison, la cour et l'emplacement en font un «lieu vraiment bien 'pour passer vos vacances. Ce est seulement une courte 1 bloc de marche de la plage ou en ville pour les restaurants, théâtre, boutiques et épiceries. La maison a été construite au cours des années 1920 et rénové en 1999 pour conserver le "Chalet" sensation. La cuisine est bien équipée pour cuisiner tout type de repas ou tout simplement pour rassembler autour de la grande table de la cuisine. Il ya toujours du café fraîchement moulu disponible pour une cafetière. Et essayer le mélangeur de lait frappé de la 1940 qui a été la famille depuis des générations. Certains ingrédients de cuisine de base sont disponibles pour utilisation (épices, sucre, sel, la farine, l'huile de canola, etc.). Mots-clés: Cannon Beach Cabin un bloc de la plage et deux blocs à la ville. Savon fourni. Douche extérieure chauffée pour laver Sand avant d'entrer dans la cabine! Un foyer est prévu adjacent à la terrasse et jardin pour guimauves grillage, etc. Apportez votre propre bois. Croquet, le badminton et les fers à cheval fourni. Great house! 3rd time staying here! This was my families 3rd time staying at the Singing Sands house. This house works perfect for us. There's plenty of room for everyone to relax their own way (puzzles, reading, watching TV) without invading each others space. The location is excellent! Just a few houses away from the beach without having to cross a busy road. A short 5 minute walk to the main downtown area with candy stores, shops and restaurants. The property was very clean and a great location. We really enjoyed our stay at the Singing Sands. Very cute house and great location. Very clean home. Singing Sands is nicely located, within blocks to the ocean and to town. Very clean, the kitchen is well stocked with pots and pans, dishes, glasses and dinnerware. The beds were comfortable, a great place for a beach retreat. There is a fenced backyard which we didn't use since it was winter. There is a backyard shower which we used to rinse off our beach boots, which would be handy in the summer. After speaking with this guest she felt she WAS leaving a five star with us, as described in her text! Oops! This cute and comfortable beach home offered the room and charm that we 6 ladies hoped for in our weekend stay at the ocean. The furnishings are perfect beachy blended with old school accents. It is well appointed and the beds were comfortable. Having ocean front access a short stroll away was the cherry on our weekend getaway. Plus the main street shopping is a few blocks walk away. Parking was adequate for our 3 vehicles as well. The yard is so well manicured with seating at 2 picnic tables plus lawn chairs for those good weather (which we were blessed with) afternoons and evenings outdoors. We didn't use the firepit but it another thoughtful addition to this home. The layout is a bit quirky but that only adds to the charm. Caution was called for in a couple of places for our 6ft 3" friend"s head but no injuries incurred! I highly recommend a stay here at the Singing Sands cottage! Thank you, Jerri ,for sharing this slice of ocean paradise with us! Clean everywhere. Well stocked kitchen. Close to everything. Got in lots of walking. Plenty of room. Loved the living room for all hanging out. Great times cooking in the kitchen. Only complaint....a light remained on at all times in what I assumed to be the furnace area. Annoying at night for that bedroom and bothersome for utility-conscious folks. Thank you for this 5 star review. We are always so pleased our guests enjoy the Singing Sands. We will definitely address the light issue so this does not happen again. Tous stocké à l'intérieur dans le placard de stockage. Wood deck may be slippery when wet or icy. Use caution.